Christians desire to address the holiday by name instead of the generic Happy Holidays to show respect. How would American Judeo-Christian forefathers, like Washington and Lincoln react to present day Christian frustration to Christmas being referred to as, ‘Happy Holidays’. It is refreshing to hear Happy Eid coming from Christian hearts and mouths around the world today. The Muslim holiday, Eid, is celebrated worldwide with merriment and festivities, following the month long Ramadan season which is a practice of daylight fasting (similar to the lent season, a one month practice of Christians before Easter). In Saudi Arabia, this year’s Eid al-Fitr will be celebrated on Thursday, the 8th of August, with the beginnings on evening before. In North America, due to the visibility of the new moon, the Eid al-Fitr will be celebrated a day later on Friday, the 9th of August. So, the sentiment of wishing a Happy Eid to all the Muslim citizens in the west will continue through Saturday this year (generally speaking Eid is a three day holiday). The Muslim holiday is practiced with the hanging of strings of lights in the streets which is similar to the streets and houses of Christians during Christmas season. Are people and their celebrations really all so different? Christians understand the frustration that can be felt when the happiest day on their calendar is merely referred to as just another ‘Happy Holiday’. For Christians, the trend of political correctness has reduced the greeting, Merry Christmas, to a verbal relic of days long past. Society could be a bit more understanding and supportive of all religious celebrations so that they don’t need to be veiled in order not to offend. Merry Christmas is much preferred to the politically correct Happy Holiday, which is commonly used today in the streets and in the workplace by most Christians. Yet, the terminology is tolerated by Christians so that the threat of being offensive is reduced. Why are so many offended? Why can’t we just get along? The world is filled with all manner of peoples of different languages, religions, races and customs, etc. The menagerie creates a beautiful tapestry that makes Earth the exotic, cultural planet that it is. The beauty of all these different colors and creations sharing one small orb and working together in harmony exemplifies an advanced world with a mature population. Celebrating every nation’s and every people’s religious holidays is far more exciting than reducing them all into events that should only be practiced behind closed doors or in the guise of politically correct, generic celebration. The sentiment of inclusion by Christianity, which spans an additional 600 years of practice compared to their Muslim brethren, has learned that inclusion is preferred to ostracization and exclusion. This understanding is probably why there is such a positive recognition by the Christian community in regards to the Muslim Holiday of Eid. Happy Eid is being heard in the streets and seen on internet blogs to help honor the now visibly global Muslim population’s celebration without the fear of offending those with different religious affiliations. It would be interesting to know how American Judeo-Christian forefathers, like Presidents Washington and Lincoln, accustomed to greetings of ‘Merry Christmas’ during the Christmas Season, would react today to the new greeting of, ‘Happy Holidays’ instead. Wouldn’t it be nice if Merry Christmas could be brought back without the fear of reprisal? Perhaps celebrating with the verbal greeting, Happy Eid, it could be a new beginning for global tolerance, appreciation and celebration for everyone’s Holy Days as they practice the religions of their choice. Shawn Rae, recording artist Shawn has completed a new CD for his American debut of his Christmas Album, ‘A World Christmas, Love Knows No Borders’ (view a live performance at: http://youtu.be/2wEIvEWBZV4 ), containing a new duet, ‘Baby It’s Cold Outside’, with singer, actress, Deana Martin, daughter of American musical icon Dean Martin. Deana’s last duet was performed with another legendary American icon, Andy Williams, providing insight as to her clout in the world of music. Shawn was chosen from among a diverse pool of current and legendary, national and international, male recording artists by the American producers to sing this particular song with Deana, a Christian, without concern for Shawn’s Muslim religious background. He was appreciated solely for his vocal capabilities. This decision presents the magnanimity on the part of the Christian and Jewish producers that chose him, as their actions show what’s possible in this modern world. 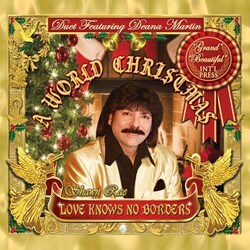 Shawn Rae’s Christmas Album, ‘A World Christmas, Love Knows No Borders’ (the first Christmas album from the Muslim world in respect of Christianity, utilizing the services of Christians, Jews, Muslims and other faiths to complete it) was promoted internationally to predominantly Muslim audiences. The Christmas album’s American debut is set for December 2013.